Our manbaby in chief has spent part of his day dealing with fallout of the tragedy at Majory Stoneman Douglas High School, where 17 people were murdered in cold blood by a weapon of war. Because this is 2018 America and rationality is out the window, we’re stuck in a debate of “let’s keep weapons of war on the battlefield” and “TURN TEACHERS INTO SOLDIERS! !” You can take a wild guess which side president “I really believe I’d run in there even if I didn’t have a weapon” falls on. Unrealistic machismo is the Trump brand (as well as the GOP’s, which is why they’re such a perfect match). Democratic Governor of Washington—Jay Inslee—riffed about how the idea to arm teachers is ludicrous, and Trump stood there like a small child getting berated by the neighbors for hitting their dog. Seriously, look at this petulant shmuck. 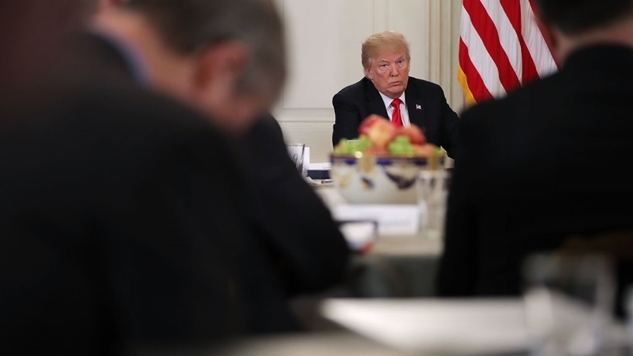 Trump clearly does not want to be here. You can tell by the pursed lips and the quick “right” interjection as Inslee begins to lecture him on what he’s heard from teachers as to why they want to, yannow, teach, and not be the first line of defense in a nation flooded with guns. The real comedy gold begins at the 26 second mark, as Trump folds his arms in what can only be framed as an “eight-year-old ordered to go to timeout” stance. Around 42 seconds, you can see Trump lean in to respond to Inslee’s remarks before quickly hunching back into a defensive position in a manner that 4chan would describe as “uber-cucking” if a liberal had pulled the same move. Around 50 seconds, you can almost see Trump beginning to come up with a derisive nickname for the governor as he straightens up and uncrosses his arms. At 54 seconds is where the true gem hits, as Inslee digs in the knife and twists by calling for “less tweeting.” You can tell that one hit home, as Trump undoubtedly began to plot his next late-night tweetstorm.